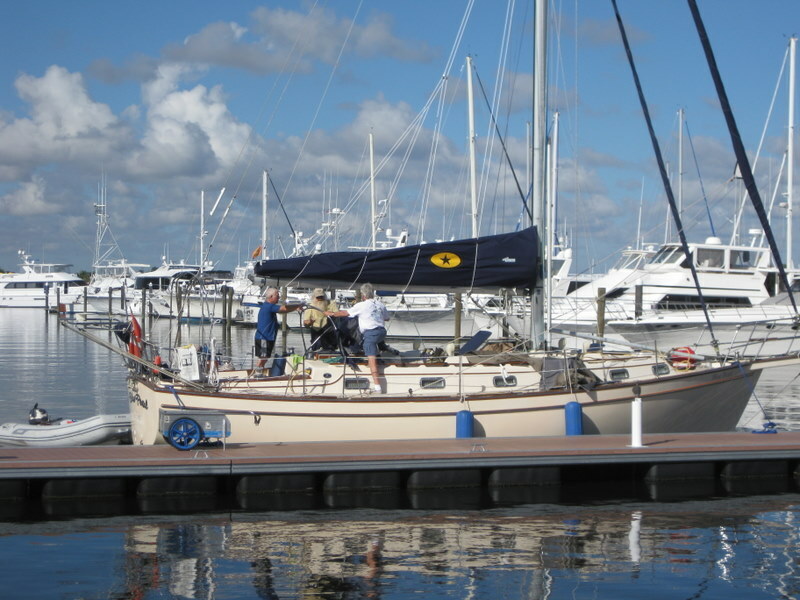 Well, we are tucked into the Lake Worth inlet, ready to launch to the Bahamas. Last year we had to wait 9 days for weather. Hopefully this year it will be better. The Dinghy Dock at Thanksgiving dinner. Al and Maria joined us in Stuart and we stayed there a few days with them. It was difficult to leave because the place is sooooo boater friendly. We moved a few miles to Manatee Pocket to be closer to the St. Lucie inlet for our trip down to Lake Worth. Al making sure the bridge is opening properly. 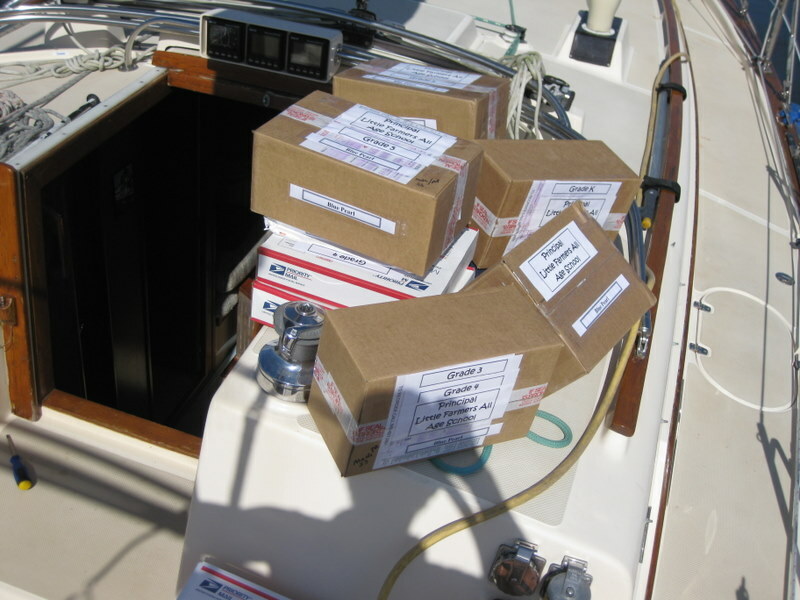 When we launched we were having problems with an engine part and had ordered a new part. That was last Friday - and a week later it is still not in. So over the weekend we have set up to take off for the Bahamas the minute we can get the new part. 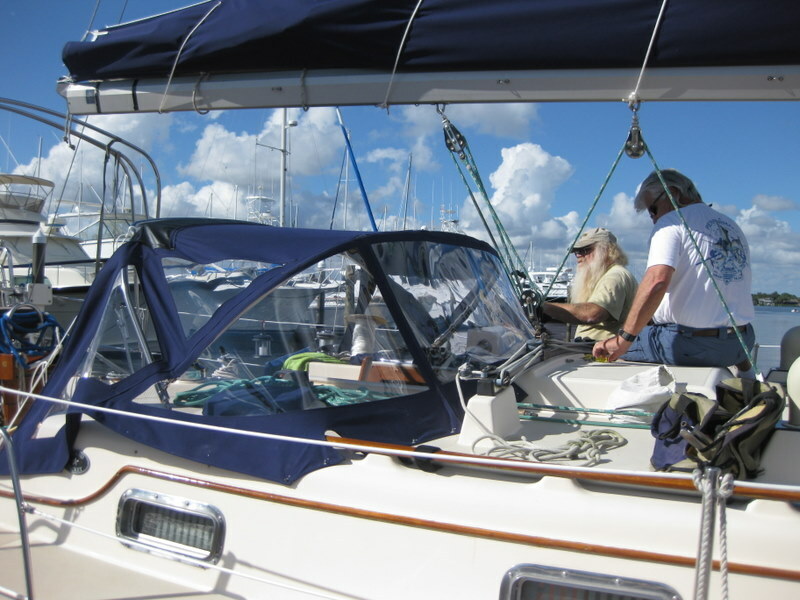 It is a challenging scheduling act - trying to cross the Gulf Stream with good weather and wait for parts so we are seaworthy. The problem with crossing occurs when the wind comes from the north. The Gulf Stream is traveling north and when it meets an opposing wind - kind of like petting a cat's back going the wrong way - the wind makes the waves all crazy and it is very uncomfortable. We missed an opportunity on Saturday and we won't be able to go Monday. We are hopeful that we can make Tuesday or Wednesday because on Thursday it changes. We are hoping the part arrives on the Monday UPS truck in Indiantown. If it does, we rent a car and drive back there to get the part. We will race back to the boat to install it and hopefully be ready for Tuesday or Wednesday. The trip south from Manatee Pocket to Lake Worth was excellent. We averaged 7 knots all the way with the wind slightly forward of the beam. We raised our new sail just out of the inlet and it looked spectacular. 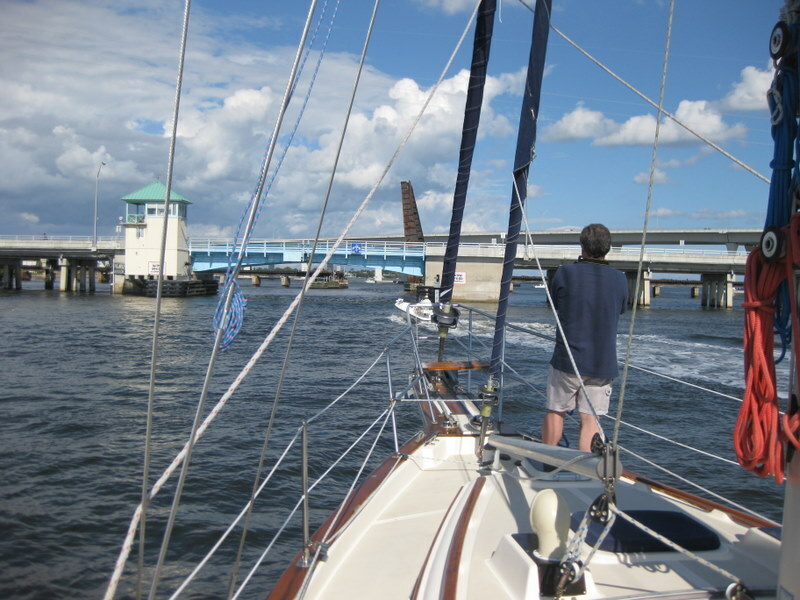 At one point we were hailed over the radio, "Island Packet near the Jupiter Inlet." We responded and he said, "I just wanted to tell you that I am on land and that you look magnificent, trucking down the coast of Florida." Big smiles! Maria spotted dolphins in the waves and Glen was soon abandoned in the cockpit while the others ran back and forth looking for our wave riding friend. It was a great day! The lunch with cold beer at anchor in Lake Worth was excellent, too! We are on a mooring ball in Stuart! Great marina with wonderful facilities. 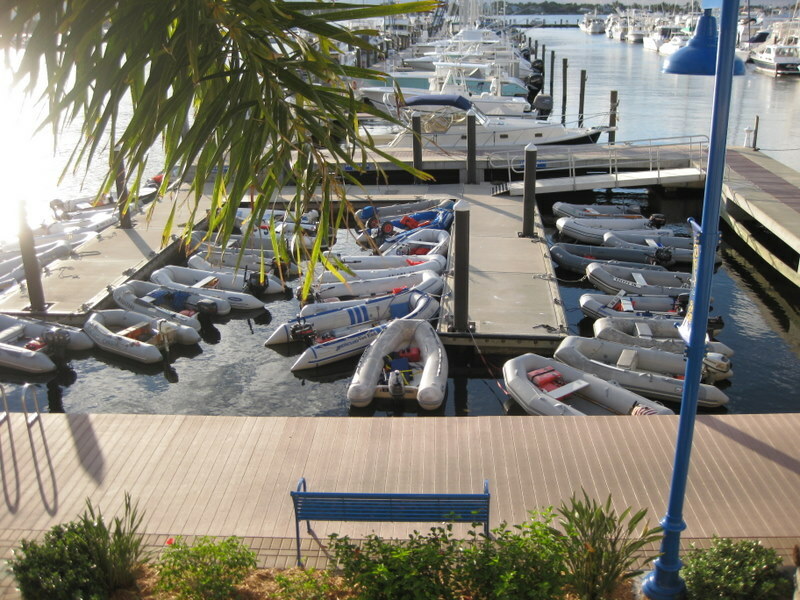 Good wi-fi, a marina lounge, a restaurant and a shuttle service with quick access to businesses in Stuart. 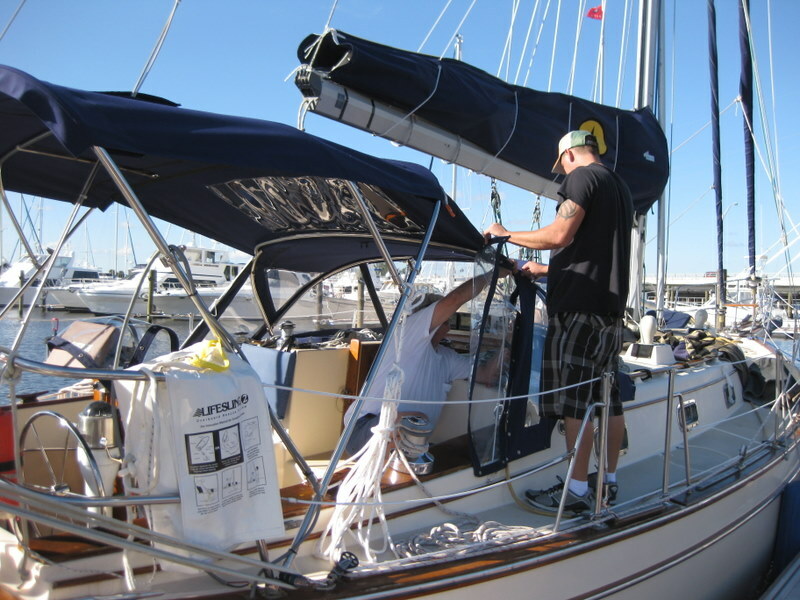 We've been able to move to their great Courtesy Dock each morning to deal with the sails and canvas. There are loads of group activities like meet-and-greets, potluck dinners and pub-crawls. We haven't taken part in many of the activities - too much to do on the boat. We will join the Thanksgiving celebration, considering what a big deal Thanksgiving is in the US. There seems to be a crowd of regulars - people who use their boats as Florida condominiums for much or all of their time. It is very comfortable and if you just wanted a Florida winter there are places like this in Vero Beach, Miami and up the west coast in Sarasota and Bradenton. We had our first visitor - cousin Duane was in Florida on vacation and was in the neighbourhood so he came for the evening and left the next morning. We are expecting Al and Maria Cohen - great friends from Abbotsford - later in the week. We are hoping that we can cross to the Bahamas with them. The new sails were installed on Monday - and they look great!! We haven't had a chance to try them out yet. We'll do that with Maria and Al. New sails and sail cover going on. Last year we picked up school books gathered by the South Seas Cruisers Association for the Georgetown elementary school. They have been delivering books to Out Island schools for years. This year our books are destined for Farmers Cay. We had a good time at their school fair last year. We had the new canvas installed - looks just like the old but newer! Solar panels back on - Yay! Sid from Quest gave us a lift to Total Wines - good thing he had a pickup! We've managed to hide away lots of beer and wine in the various lockers. Blue Pearl is floating a little lower today. We are finally in retirement mode - the chores are mostly done and we are enjoying idle time reading, planning, chatting and visiting. We listened to Cruiseheimers (nyuck, nyuck) this morning and heard from many familiar voices in Florida and favorite places in the Bahamas. The weather has been great - sunny, hot days and we seek out shade and cool breezes. Quite a contrast to Vancouver. We've been hearing from friends and family that it has been unusually cold. 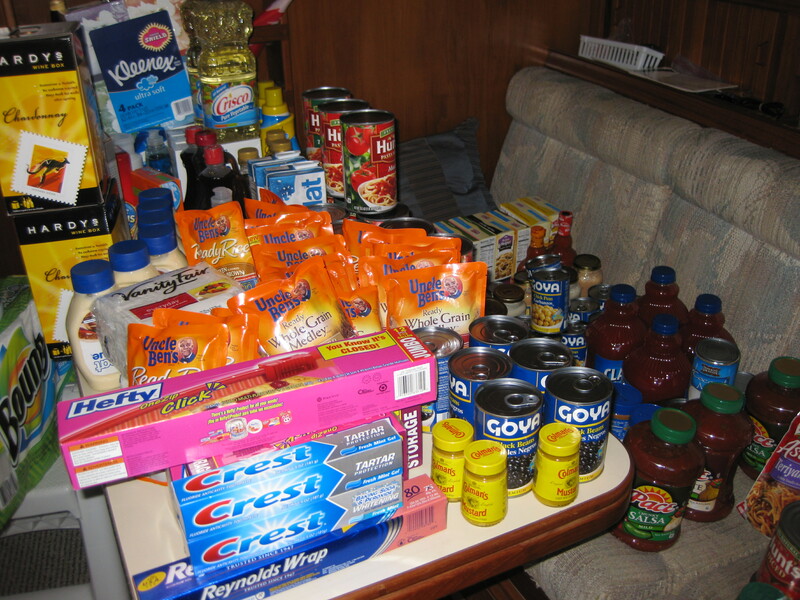 So, we will enjoy Thanksgiving with the crowd - the marina supplies the turkey and ham, we bring the side dishes. 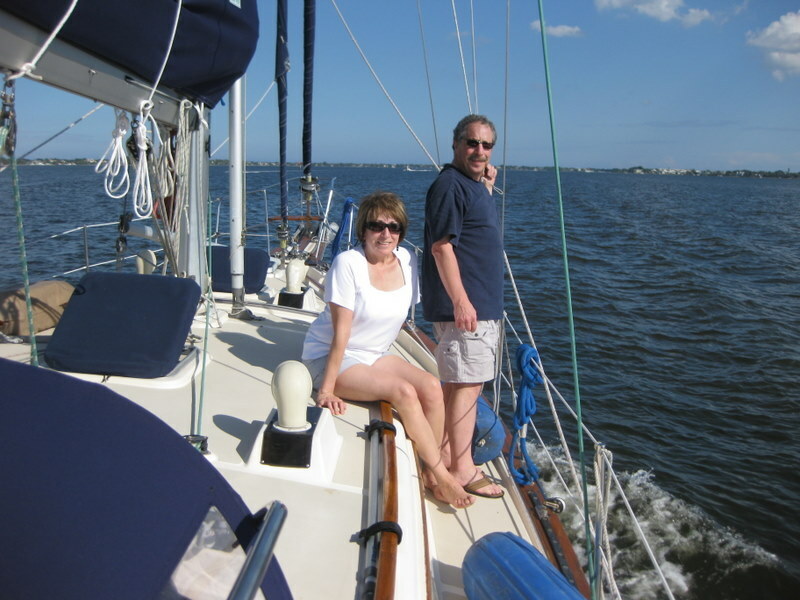 Al and Maria will be here Friday and we will do our final provisioning and chores. 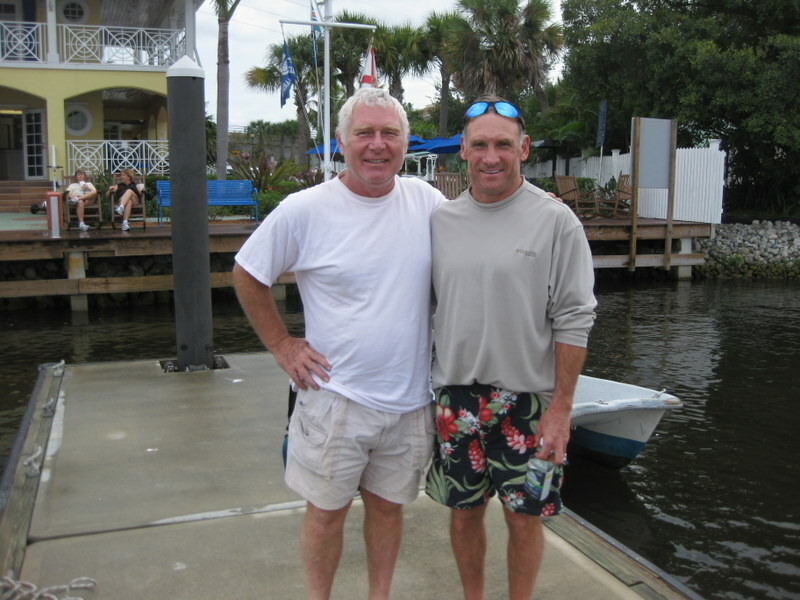 Then we move to the Lake Worth inlet so we can race out into the Stream when the weather allows. We thought we'd be in the water last week. However, things have taken longer than we anticipated and we are tentatively scheduled to launch on Thursday. We are hopeful but not optimistic. 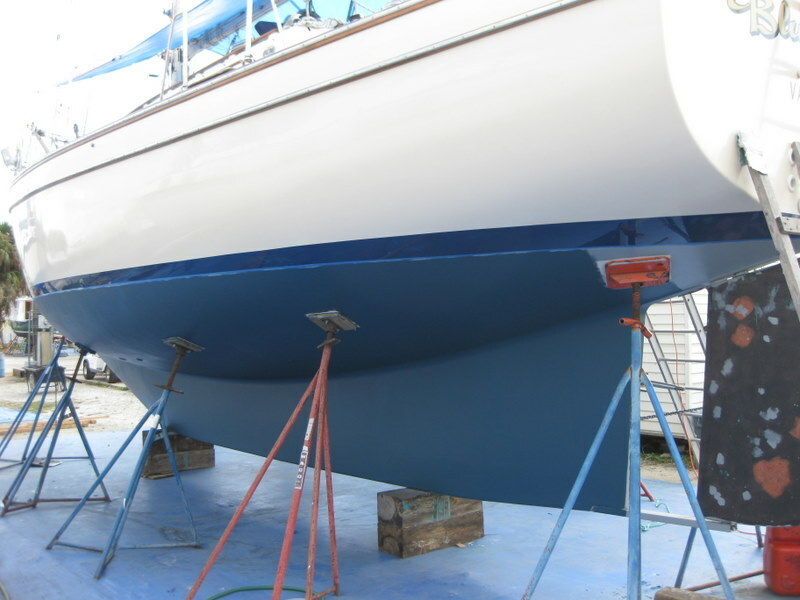 We scraped the bottom and have had it sanded down to the gelcoat - ready for barrier coat and bottom paint. Big job - but it will be good for several years. More bottom... and new Blue Pearl! 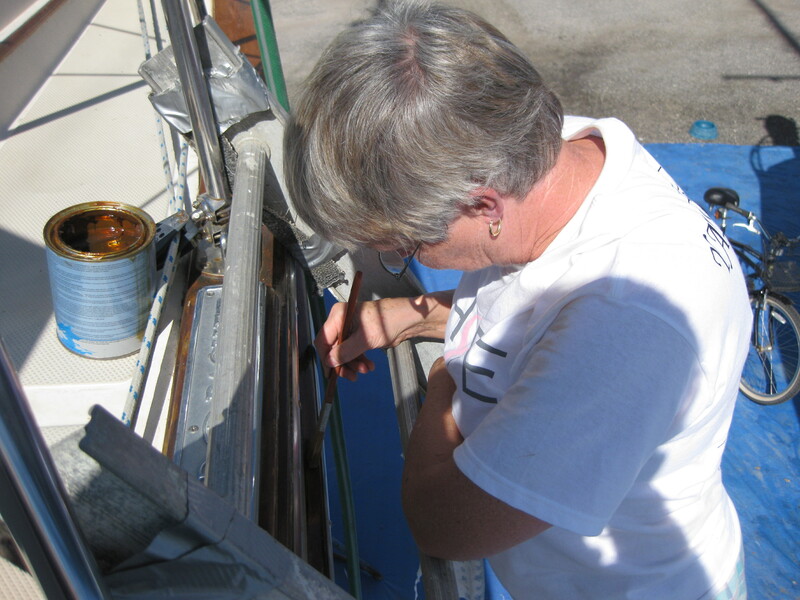 Pam has done most of the scraping, sanding, cleaning and painting of the teak rub rails and she hopes to be done before we launch. 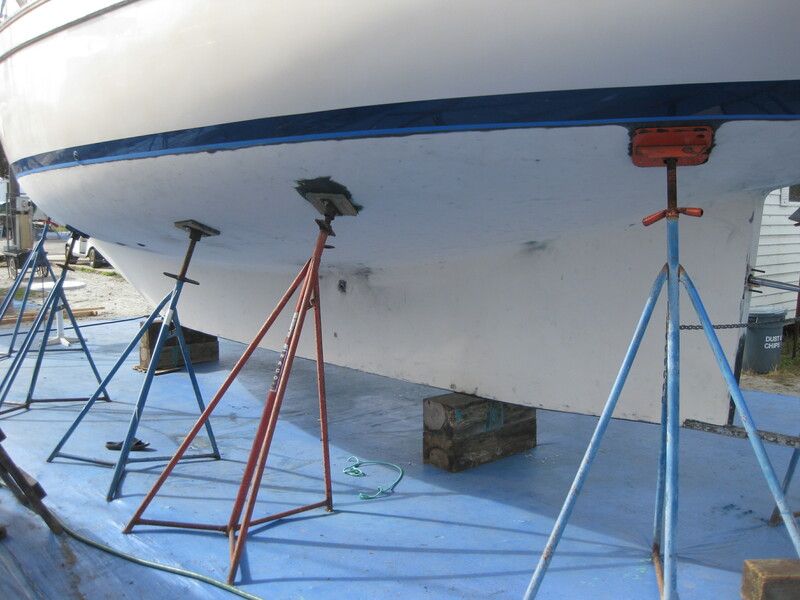 There is a lot more teak to do but this is stuff that has to be done before we are in the water. The rest can wait. 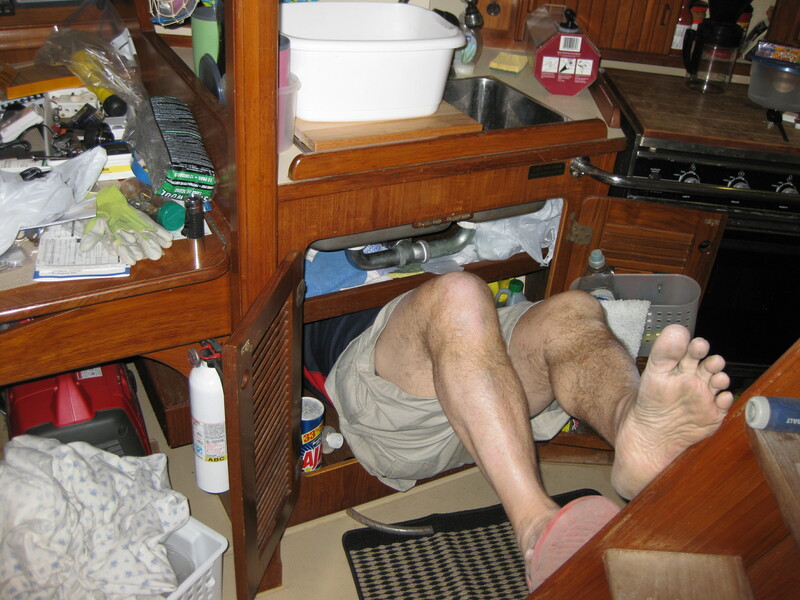 We've added a drinking water filter and changed some hoses under the galley. That's a tight fit. Need to lose some weight or hire a monkey! We've taken out the cutlass bearing - the thing that keeps the boat watertight around the propellor shaft - and replaced it with a new one. The job should be done by Wednesday. 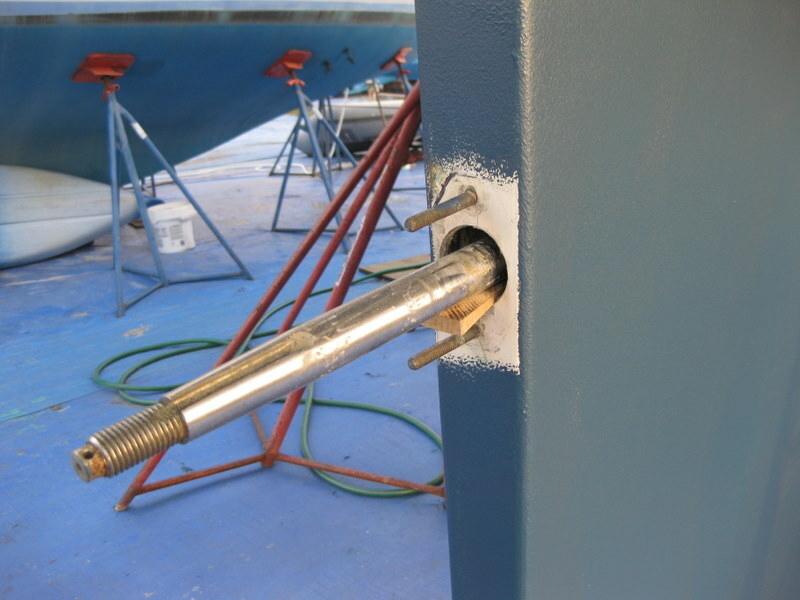 Stern tube with new cutlass bearing goes here. 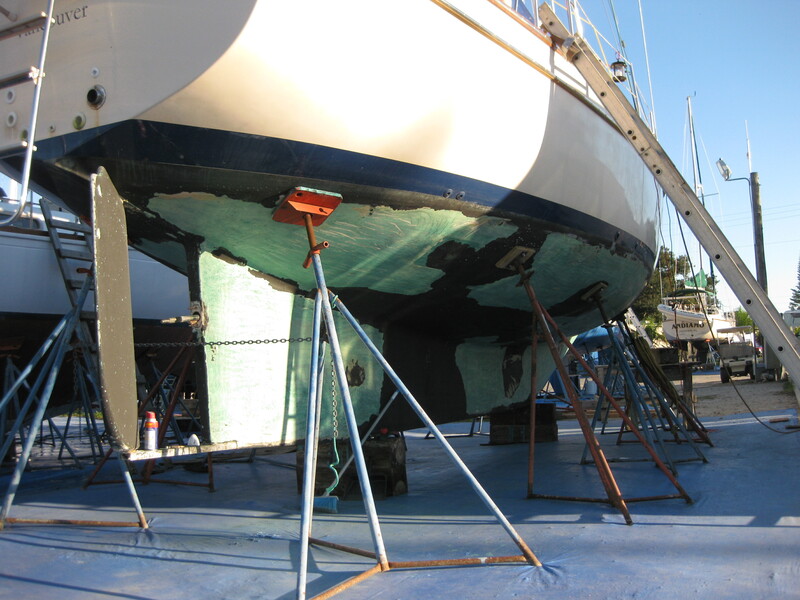 We've cleaned and waxed the hull so it sparkles! Buff! The boat, I mean. We have started to provision - this is a small part of the hoard that Pam will stow in all the various lockers and hiding places on the boat. We will do a Costco run in the next day or so to get the big stuff. The boat needs to be in the water before we can start the fridge and freezer so we have to wait before we buy the freezer stuff. 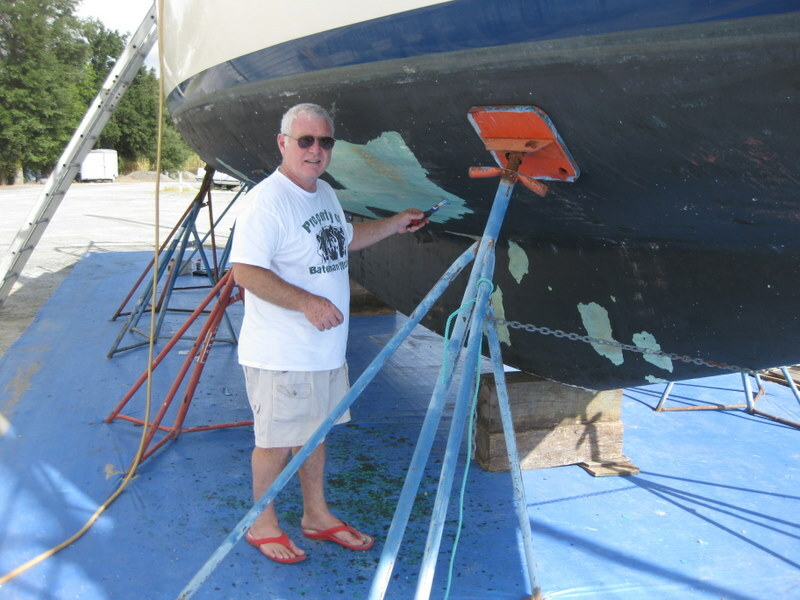 So - we work every day on new jobs, hoping we can get the big stuff done so we can get in the water. 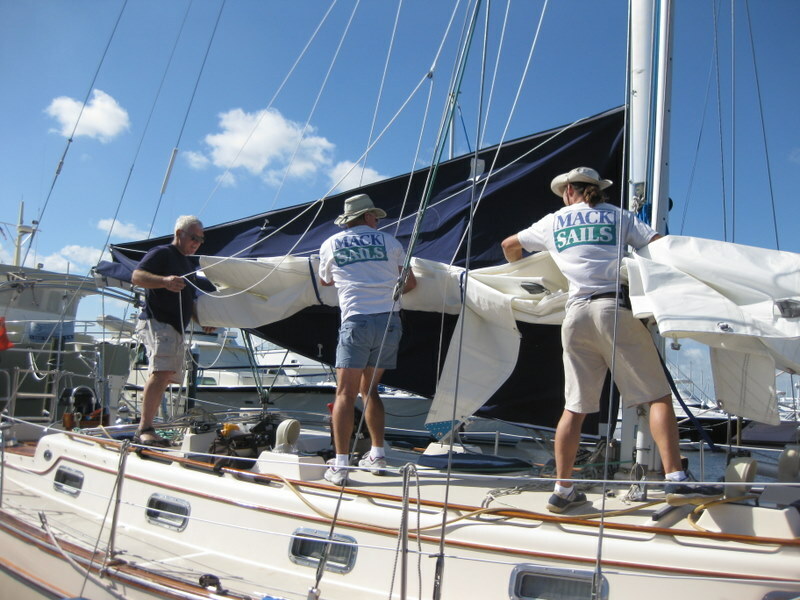 We are scheduled to be in Stuart for Monday so Mack Sails can put a new main sail and additional toys on the boat. 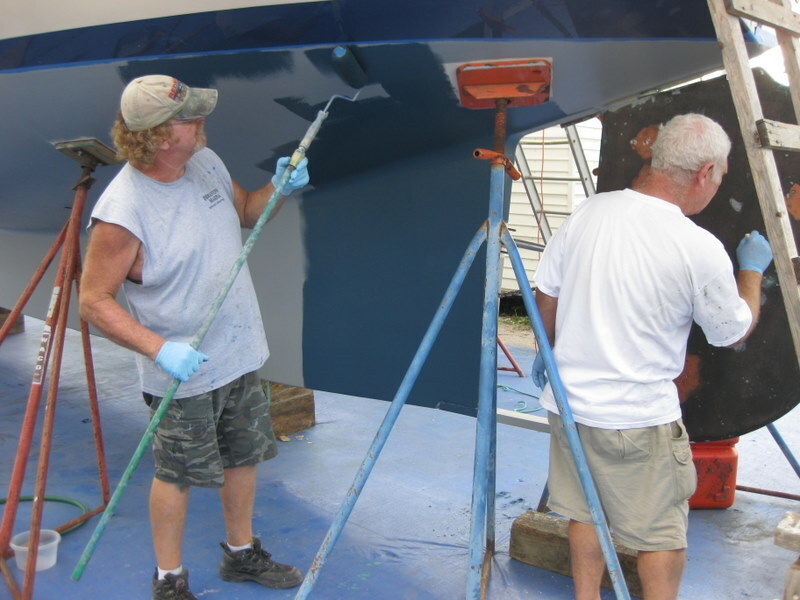 The canvas people will be there on Tuesday to put on the new dodger and bimini. Jen called today to say that she and Jackson will be with us early in January, just after we say goodbye to Brad. We've heard from Maria and Al Cohen that they will down on Wednesday. Maybe a crossing right away to the Bahamas with them? We had a terrific six months at home with family and friends. The newest member of our family, grandson Jackson Closs, is thriving and commands centre stage at any family gathering. It is great to watch him grow. We are in withdrawal after seeing him several times a week and having a visit with him and his mom for 4 days in October. We spent time with great pals on the Sunshine Coast, visited relatives in the UK and Scotland and enjoyed fun times with our wonderful Abbotsford connections. 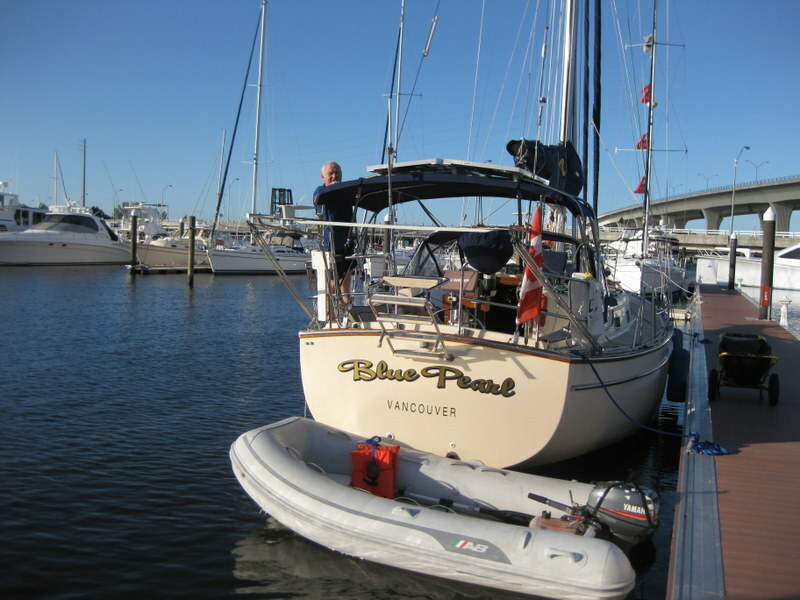 However, our other life has kicked in and we are leaving the Vancouver winter for the sunny islands of the Bahamas. 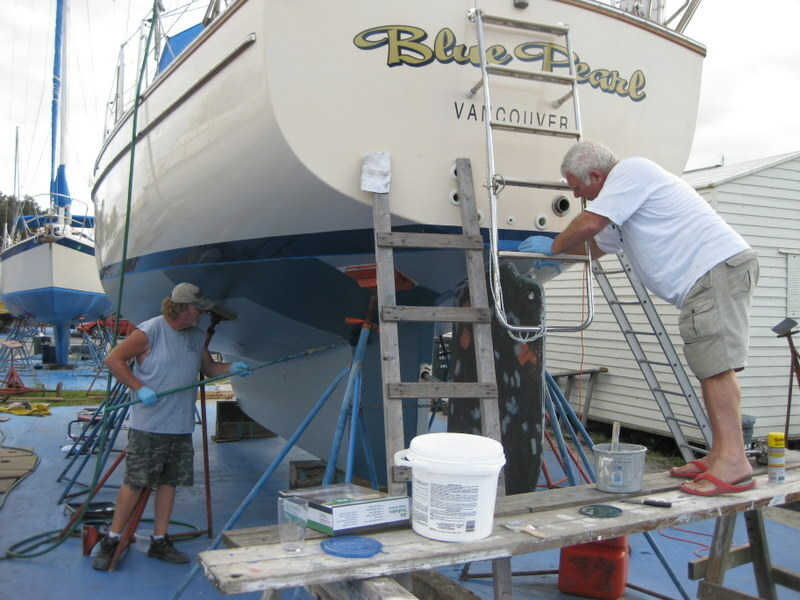 We have moved back onto the Blue Pearl - although she is sitting on blocks in the work yard in Indiantown, Florida and you need to climb down a ladder if you need to find a washroom in the middle of the night. Pam is convinced there is an alligator (see our last post) at the bottom of the ladder (she hears a clock ticking) and so she manages to wait until morning. Only 95% left to do! 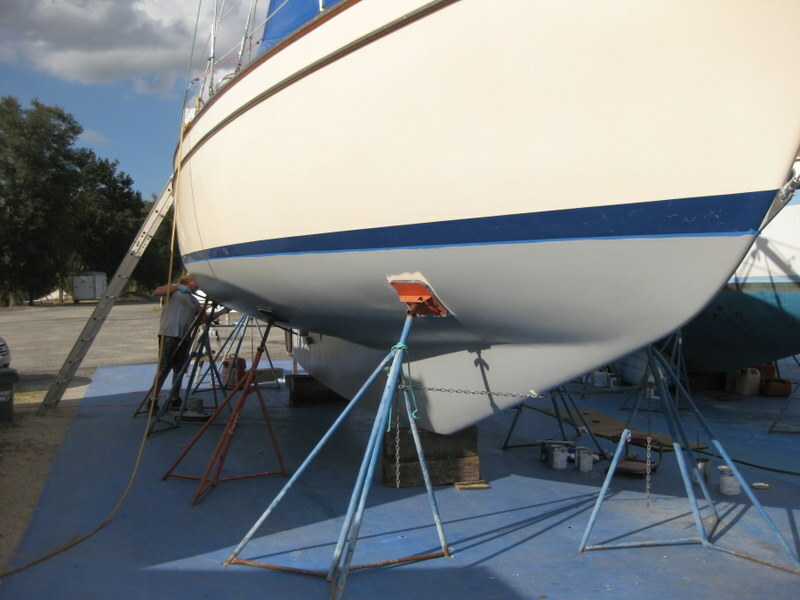 We will paint the bottom, replace some sails and canvas, do a myriad of other smaller maintenance items and then look for a weather opportunity to head across to the Islands in the Stream. Brad will be down over Christmas, Carrie at Spring Break and Jen is trying to figure out when is the best time to travel with a busy, inquisitive little boy. Many of our guests from last year are planning to return... and we have commitments from others who plan to visit us on the Blue Pearl. We are very excited about the possibility of a visit from Uncle Bob! Those of you who know Uncle Bob know how much he would love the clear Bahamian waters. We've already made preliminary visits to West Marine to buy tons of supplies. Total Wines will be pleased to see us back as well! VISA called the other day because we hadn't purchased anything. Wondered if we'd lost our card. 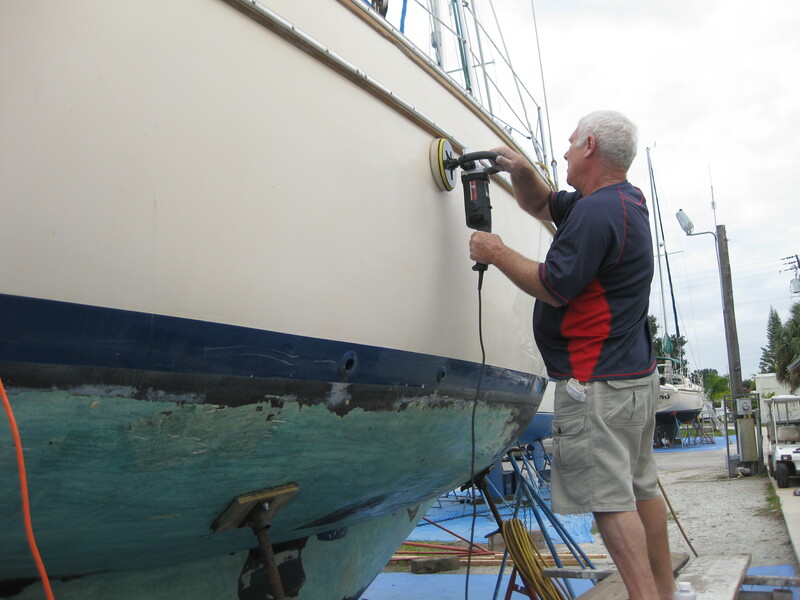 We will be working here in Indiantown for another week, then on to Stuart to have our sails and canvas installed. If that takes another week then we should be ready to cross the Gulf Stream to the Bahamas when the weather provides us an opportunity later in November.